According to the public records Russian’ museums preserve almost 90 million cultural and historical items. Russian network of museums is various, ones own and preserve unique collections, museum’ installations, exhibits are visited by over 80 million people every year. From the beginning of the 90s Russia has been enacted some Laws covering its cultural and historical heritage: the Law “Foundations of Russian Federation Legislation on Culture” (1992), the Law "On Export and Import of Cultural Valuables" (1993), the Law “On Library Work” (1994), the Federal Law “On Museum Fund of Russian Federation and Museums in Russian Federation” (1996), the Federal Law “On Cultural Valuables Moved to the USSR as Result of the Second World War and Located in Russian Federation” (1998), the Federal Law “On Objects of Cultural Heritage of Russian Federation People” (2002), the Federal Law “On Archival Work in Russian Federation”. 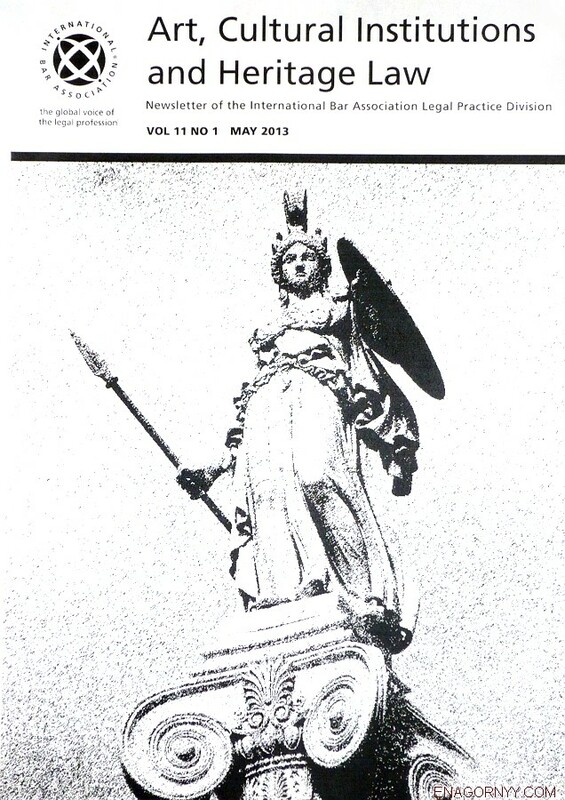 publication of museum’ items and collections and exercising of educational activity. Apart from that extract of the Law on Museum there are still number of incomplete rules which are rather harshness but by the fact hardly enforced and unworkable. That dictates and wordings have given rise for a lot of criticism from the museum community. The four goals called in the Article 27 of the Law on Museums have been formulated and completed as following: “The four primary tasks of any museum, the preservation, study, expansion and presentation of museum items, exist and are realized only as a complete whole”. Having closely analysed the Law on Museums’ rules, it is obviously, to be effective the museums and culture treatment in laws and regulations should be changed substantially as commensurate with the 21st century and the public interest. In order to administer museums on efficient basis the Law on Museums should include more clear rules, for example, with regard to specifying legal relations in the field of museums to ensure the operation of museums and to promote the preservation of the cultural heritage of Russia and development possibilities of museums. On the other hand for solving that task the Government will have to reconsider some substantive law matters and mechanisms of the legislation on culture and museums. The most professionals of museum community are aware of the problems created by the ambiguity and uncertainty of current applicable legislation on culture and museums, particularly. However, the executive bodies empowered by the Law on Museums have so far proved unwilling to use the proposals of the museum community to organize the museum’s work effectively. As said the President of the Union of Museums of Russia, General Director of the State Hermitage Museum Mr. M.B. Piotrovsky: “Because of the inaction of the authorized executive bodies, hundreds of museums have been left facing substantial reductions in their budgetary financing, the physical deterioration of museum’s buildings, structures and equipment, the perception of a museum as entertainment or a formal part of a “tourist product”. In fact, that sounds as the death knell for many museums in Russia. The sticking point is the leverage that ensures effective promoting and developing museums. In 2002 Russian museums set up the Union of Museums of Russia which has done tremendous work and produce to the Government the Program on Safety of Museum’s Holdings, the Strategy on Developing of Museum’s Work and the National Report on State of Museum’s Work. Besides, the Union of Museums of Russia presented to the cultural and governmental authorities the State Program for Ensuring the Safety of the Museum Holdings of the Russian Federation until 2020 and the Draft of the Strategy for the Development of Museum Work in the Russian Federation until 2030. However, it is not all plain sailing, a cumbersome bureaucracy continues to cling stubbornly to “Paleozoic” ideas they thought true, even though the realities are to the contrary. In light of these findings, to straighten out the situation, the professionals of culture, museum community and the President Vladimir Putin held a meeting in Saratov city on 05 April 2012 and a session of the Council on Culture and Art on 25 September 2012. The tasks of preservation, study, expansion and presentation of museum items, possibilities solving museum’s economic and legal problems as well as the issues of the state supporting on providing of museum’s infrastructure and scientific activities were discussed by Vladimir Putin and members of museum community at those meetings. Albeit, the Minister of Culture and the President of Russian Federation Vladimir Putin nowadays have devoted perceptible attention to the historical and cultural heritage and museums in Russia, at the same time, there are number of the proposals of museum community related to law changes have been pigeonholed by the Federal and local authorities. It’s also necessary to take into account that Russia is need of a new, modern law which will be sufficiently clear and effective by a range of issues. The complexity and necessity of museum legislation modernizing and drastically altering museum’s activities, prohibition of privatization of historical and cultural heritage lands become apparent, therefore the public officials need less talk and more doing as museum’ workers do. 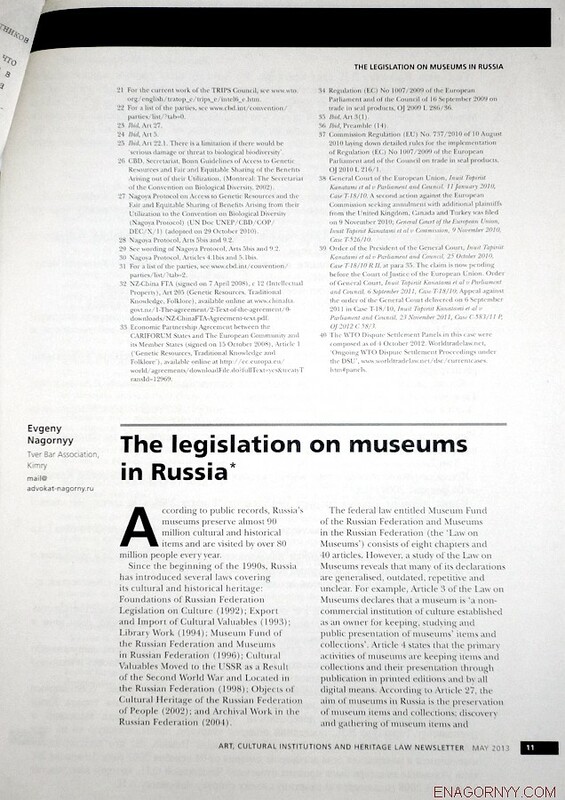 To the top of article "The Legislation on Museums in Russia"